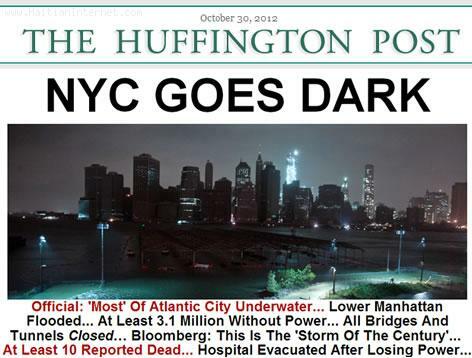 I thought Haiti has it bad with Hurricane Sandy and then I saw this... Front page on Huffington Post Website... NYC Goes Dark! How is my Haitian diaspora in NEW YORK is doing??? Mezanmi... Pran anpil prekosyon wi! Most of Atlantic City (New Jersey) is Underwater! At least 3 Million without power! If you are in the tri-state (NY, NY, CT) area and you still have power, do reply and let us know how bad it is.